A native of Philadelphia, PA, Nealis joined the MCM staff in 1993. Prior to the MCM, Nealis served in the United States Marine Corps. He was commissioned in May of 1975, after receiving his Bachelor’s Degree in Accounting from Villanova University. His 20-year military career includes deployments aboard the USS Tarawa, USS Okinawa, and the USS Tripoli, as part of the amphibious ready group during the Iranian Hostage rescue attempt. While in the U.S. Marine Corps, Nealis furthered his education earning a Master of Business Administration in Management from Golden State University and a Master of Science in Human Organizational Services from Villanova University. In 1994, then-Maj. Rick Nealis organized Oprah Winfrey’s participation in the MCM. Following retirement from the Marine Corps, Nealis served as Olympic Torch Deputy Caravan Coordinator for the Centennial Olympic Games in Atlanta. He carried the Olympic Torch during the longest leg of the relay occurring in Young Harris, GA on July 16, 1996. In 2002, Nealis served as a member of the security team for the Olympic Torch Relay for the Olympic Games in Salt Lake City. On December 19, 2001, he again carried the Olympic Torch in Uniontown, PA. In 2009, Nealis was inducted into Running USA’s Hall of Champions and in 2010, he was named “Race Director of the Year” by Road Race Management and MarathonFoto. Nealis has completed five marathons (including three MCMs), and boasts a PR of 3:09:50 obtained at the 1983 MCM. An employee of the MCM since 1994, Anderson oversees the various branches within the MCM organization and develops new projects to enhance the event experience. She received a Bachelor’s Degree in Business Administration in Germany in 1979 and went on to serve as the Marketing Coordinator for UVEX sporting goods, before becoming an Immigration and Naturalization Civil servant in Germany. She earned a second Bachelor’s Degree in Business and Marketing in 1998 from the University of Mary Washington, VA and has participated in the United States Marine Corps' Civilian Leadership Program and Toastmasters International. She also received her Long Distance Coaching certification from RRCA (Road Runners Club of America) in 2014. Anderson has participated in triathlons, half marathons and marathons, including the Boston Marathon, which she completed in 2010. Following nine years of active duty Marine Corps service, Delahoussaye, a logistician by trade, joined the MCM organization in 2003. He manages the MCM’s contracting, procurement and safety programs, warehouse operations and the MCM vehicle fleet. He also is responsible for the collection and distribution of inventory and for the set up and clean-up of each MCM event. Goldman has supervised the tremendous growth of the MCM sponsorship program, notably working with 24 Fortune 100 companies. He oversees the marketing department that includes sponsorship sales and fulfillment, public and community relations, social media, graphic design and advertising, video production, website, brand management and expo production. Goldman has worked in sports/event marketing in the DC area since 1993 including serving as Public Relations Director for Capital One Arena and, later, the Downtown DC Business Improvement District. He is a graduate of Penn State University. Jackson joined the MCM leadership team in 2007. He served 26 years in the Marine Corps and retired as the Senior Enlisted Leader for MCCS (Marine Corps Community Services). As the MCM Business Manager, Jackson leads the online registration process, customer service, database management, finances and MCM Charity Program He also works with military commands participating in MCM Forward, which consists of deployed service members running the MCM. Schmidt joined the MCM staff in 2003, following his retirement from 23 years of active duty service in the United States Marine Corps. He is responsible for coordinating Marine participation in event operations, directing the Special Project Officers in their various responsibilities. Schmidt serves as law enforcement liaison, oversees permitting and volunteer recruiting, as well as course certification and medical operations. 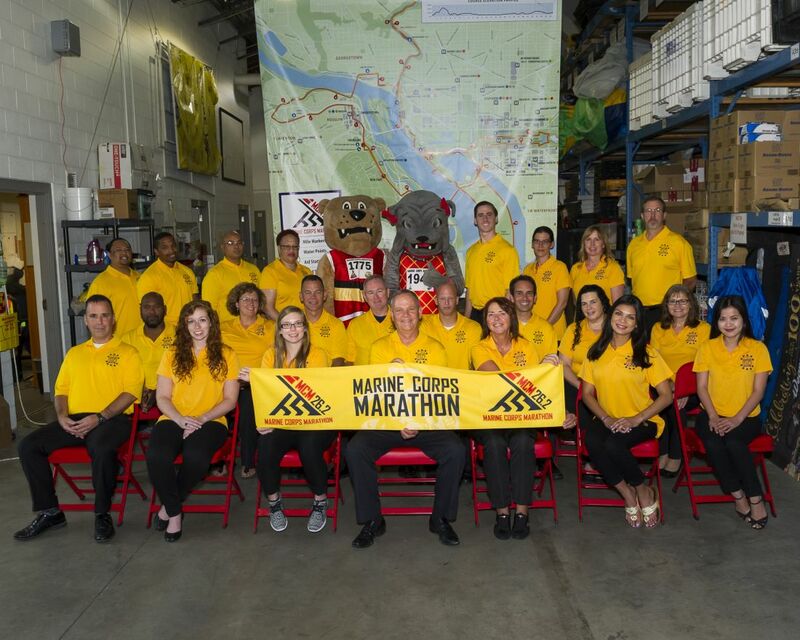 While on active duty, Schmidt coached the Marine Corps Running Team from 1998- 2002, participating in 12 MCMs as a team member and boasts a 2:59:00 PR. Serving as the organization’s primary contact for the media, Topolosky communicates the MCM Organization’s mission and is responsible for overseeing media operations for all events. She connects with a variety of national and local media outlets throughout the year to tell runners’ stories, share press releases and deliver MCM messaging. Topolosky has a professional marketing communications background and is a graduate of George Mason University. For media inquiries, please contact Ms. Topolosky at ashley.topolosky@usmc-mccs.org. Aquino oversees the highly successful MCM Charity Partner program, including more than 100 charities annually. The program enables charitable organizations to participate in the MCM as a platform for raising funds and awareness. He separated from Marine Corps active duty service in 2008. As the MCM Expo Coordinator, Molina oversees planning, organizing and managing of the MCM and Historic Half expos. She serves as liaison between the MCM, the host venue and expo design company. Molina is responsible for the coordination and sales of expo booths working with hundreds of corporate partners, small businesses, event sponsors and charitable organizations.